Historically, a “titling font” was a font of metal type designed specifically for use at larger point sizes and display settings, including headlines and titles. Titling fonts, a specialized subset of display typefaces, differ from their text counterparts in that their scale, proportion and design details have been modified to look their best at larger sizes. They often have a more pronounced weight contrast (resulting in thinner thins), tighter spacing, and more condensed proportions than their text-sized cousins. Titling fonts may also have distinctive refinements that enhance their elegance and impact. Titling fonts are most often all-cap, single-weight variants created to complement text families, such as the titling fonts designed as part of the Dante, Plantin, Bembo, Adobe Garamond Pro, and ITC Golden Cockerel typeface families. 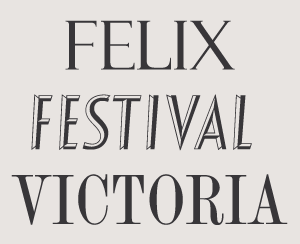 They can also be standalone designs, such as Felix Titling, Festival Titling, and Victoria Titling Condensed. Occasional exceptions exist to the all-cap, single-weight norm. 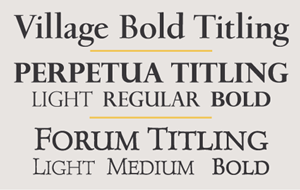 Village Bold Titling has a lowercase; Perpetua Titling has three weights; and Forum Titling, based on a Frederick Goudy design, has small caps in three weights that were added later. 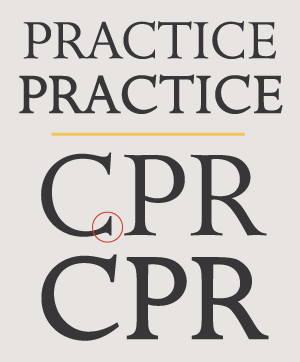 Both Perpetua Titling (left) and Perpetua Regular (right) are the exact same point size in this illustration, but since titling fonts are historically the full size of the type body, they can be taller than the regular caps in some digital fonts. Titling fonts tend to have a refined, even dramatic look – qualities that make them indispensable for books, magazines, movie titles and sequences, signage, or any other usage that calls for emphasis as well as a touch of elegance. Dante Titling (upper) has greater weight contrast and is slightly more condensed than Dante Regular (lower). Note the slimmer serifs. ITC Golden Cockerel Titling (upper) is more streamlined than its non-titling cousin (lower). 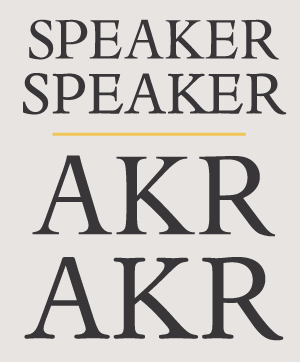 It also has different finishing details, as shown on the serif ending stroke of the C.
These three titling designs deviate from the norm: Village Bold Titling contains a lowercase, Perpetua Titling comes in three weights, and Forum Titling not only has three weights, but contains small caps. These titling faces are stand-alone designs, rather than a family.